What Color Blazer Do I Wear with Navy Pants? Navy pants appear in nearly every man closet and choosing the right color blazer can help you get a polished look. 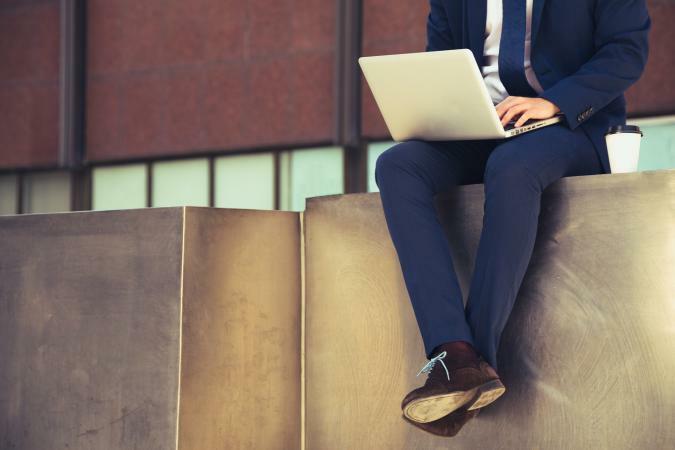 Even if the blazer decision comes down to the last minute, like just before an important meeting or a job interview, you can get a pulled-together style by knowing which one to choose. When it comes to matching a blazer with a pair of navy pants, women traditionally had the more difficult decisions to make as men's navy pants were generally rather formal and men were more limited with their color selection. But now with plenty of new colors and styles in men's fashion, the issue of blazer selection with navy pants has become more complicated. What Should Men Wear With Brown Shoes? In addition to your blazer, you will need to determine what color to wear underneath the blazer, and what colors to use as accents. You can try one of the following looks with your navy pants. 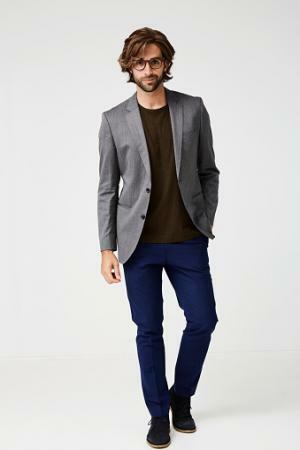 The easiest color to match with a pair of navy blue pants is a blazer of the same color. The look of a two-piece suit will look sharp and polished for any occasion. The best to way to get an exact match is to take your navy pants with you when shopping for the navy blazer. You can then put the two garments next to each other and compare the colors of the fabrics to make sure that they work. Make sure you choose a lighter hued shirt that will pop underneath your navy two piece. White looks clean, crisp and classic, whereas baby pink adds a quirky, fashion-forward feel to your look. You can also opt for a navy shirt for a classic, toned down aesthetic. Neutral tones such as brown or gray match with navy quite nicely. The right shade of gray looks very stylish with navy pants. Go for a lighter hue and pair with a complementary pair of shoes and belt. Dark colors generally clash against navy. 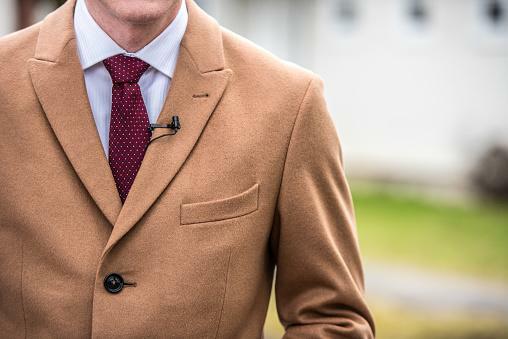 If brown is your color, you'd be better off choosing a light or medium shade for your blazer, rather than chocolate brown. A different shade of blue works with navy pants if the shirt worn underneath is a more neutral color. Duck egg blue or steel blue is considered a cool and quirky hue in the fashion world and looks great with navy, especially when paired with a white shirt or top. Any plaid patterned blazer that contains dark blue also works, regardless of main shade, as it picks up the navy hue of the pants. The blue blazer is often worn with khaki or tan colored pants, but the reverse doesn't work quite as well. 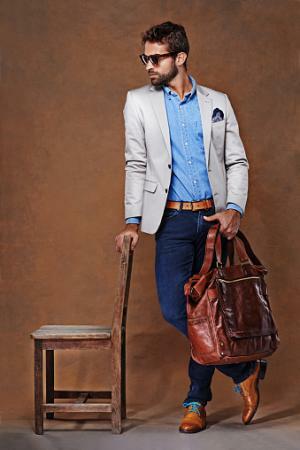 Try a camel colored blazer with brown shoes and belt for a formal but fun look. The camel blazer and navy pants combo looks great during the summer months as a unique, fashion-forward ensemble. Navy blue pants look really good with white or stone; think the "nautical sailor" theme. If you pair your navy blue pants with a white blazer, opt for baby pink shirt, light blue, or a matching white shirt for an eccentric summertime aesthetic. However, if you want a more laid-back feel to your outfit for a casual occasion, simply thrown on a striped navy and white sweater, top, or long sleeved t-shirt under your white or stone blazer. If you like to be creative, you might want to try a pastel, baby pink or reddish-pink with your navy pants. 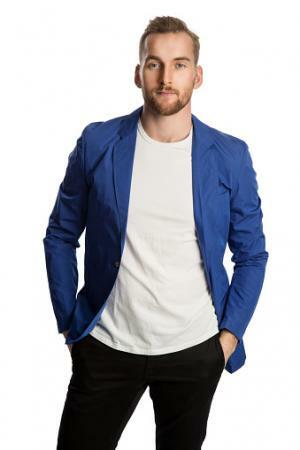 Complementary colors are a difficult decision when it comes to what color shirt you should wear with baby pink and navy, but match just fine to your blazer and you will attract plenty of attention without looking too overpowering. Dark, reddish-pink also makes you stand out for all the right reasons when paired with navy pants. Opt for a white shirt with either color blazer, as it comes across as fresh and summery. There are some other aspects of your outfit that you should bear in mind when want to wear your navy pants. You also want to make sure that all of your accessories match or complement your navy pants, as well as your blazer. For example, a navy pair of pants worn with a gold belt buckle won't look good with even the best color match if the buttons are silver. Some prefer to match dark gray or black with navy. These colors don't specifically "clash," it's true; however, the colors may be too close to one another to contrast enough for the look you want to pull off. Another factor to consider is the shape and fit of the pants. This also factors heavily into what type of blazer you wear, so don't simply assume color is the only criterion used for matching. If you are wearing a tailored blazer, the pants should be tailored as well. Above all remember that you can make nearly any color look good with the versatile navy pant as long as you accessorize and color match. Don't throw out the rule book or start from scratch; rather, use it as a guidebook from which to expand. Have fun when you decide what color blazer to wear with your navy pants. After all, looking your best should never feel like a chore.